​​Without a doubt, Beijing is one of the world's greatest cities. The cultural heart of China, it combines ancient sites like the Forbidden Palace with the more recent history of Tian’Anmen Square, all accessible by a state-of-the-art, easily navigable transport network that was upgraded in 2008 for the Olympics. An easy day trip to the truly magnificent Great Wall of China is the icing on the cake. ​Beijing now features on the networks of several major airlines and is easily linked with other parts of China by plane, train or bus. Beijing's metro system is excellent and very cheap, with English signage and information throughout. ​There is a range of accommodation and facilities across the city - our favourites are located in the charismatic hutongs of old Beijing. ​Beijing has four distinct seasons - Spring is March through May bringing dry weather with an average daily temperature of 20°C. The long, hot summer lasts from June through September with the hottest and wettest months being July and August where temperatures regularly top 30°C. October and November see Autumn and an average daily temperature of 15°C. Winter, December through February, brings snow and temperatures which often don't exceed freezing. 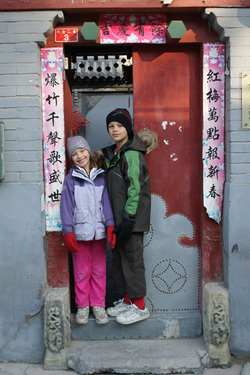 We visited Beijing in 2011 with our children aged 7 and 10. ​Click on the sample itinerary below to view a suggested family holiday for this destination. This is based on our own travels but can be amended to suit differing ages, group sizes and duration. Accommodation and guide details will be provided once your personalised itinerary is confirmed.